Even if you have never heard the name Giovanni Benedetto Castiglione (1609-1664) – and admittedly there are many of us that haven’t – the title ‘Lost Genius’ given to the exhibition curated by the Queens Gallery[i] now travelling to the Denver Art Museum may raise a few questions. How can one lose a genius? It is up to the British Royal Collection to answer that since they did indeed. Castiglione’s work was never physically lost, his drawings never stolen, or misplaced, he merely got forgotten. It was King George III who purchased a large share of the Genoese artist’s works, close to 100 drawings, etchings, and monotypes, estimated to be about one third of his known remaining works. Seemingly an impressive number, compared to the size of the Royal Collection however Castigliones work could be considered a mere drop in the ocean. Being one of the largest and most important art collections in the entire world, the Royal Collection contains more than 7,000 paintings, 40,000 drawings and 150,000 prints. Considering its magnitude, one shouldn’t be too surprised that the work of an Italian Baroque master may get lost or be forgotten. And so the masterfully conducted drawings, etchings, and prints have been gathering dust (figuratively), until recently. A presumed self-portrait, c. 1645-1650. Etching, 18.8 x 13.8 cm. So who is this Castiglione then? Not to be confused with Baldassare Castiglione, the Italian 16th century writer, Giovanni Benedetto Castiglione was a Baroque master of the Genoese school, painter of portraits, historical pieces, mythological episodes, biblical scenes and landscapes. Especially his drawings and sketches are awe-inspiring. Wildly recognised in his own time among the general public, his fame vanished after about a century following his death. Circe with the Companions of Odysseus Transformed into Animals, c. 1650. Etching, 21.8 x 31.1 cm. In that tradition the Genoese artist known as Il Grechetto lived an agitated life. In addition to the twelve lawsuits he faced throughout the years, there are records of him shooting at an artist who had mocked him, of numerous brawls, and finally the anecdote of him trying to throw his own sister off a roof. He was following in the footsteps of Caravaggio, his life being a tale of hot-headedness, fights, and a lack of self-control. His drawings do not lack confidence as seen in the Self-portrait (1645-1650) where Giovanni Benedetto Castiglione looks at us, with frowned eyebrows under a beret, an air of arrogance in his magnificently drawn face, almost judging. 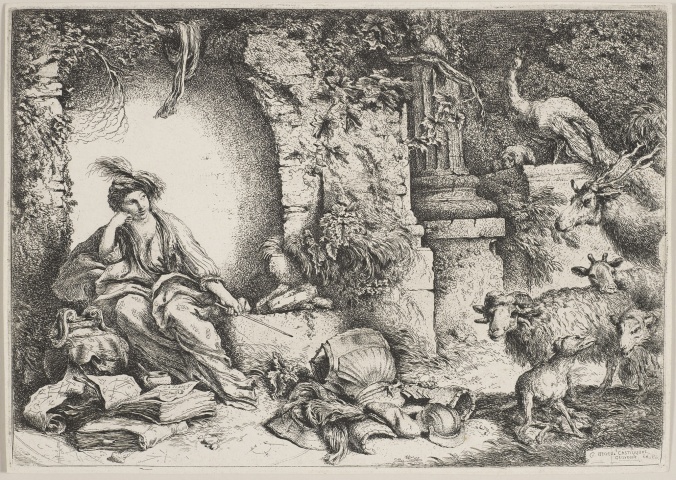 And then there is the etching The Genius of Castiglione (1648), an allegorical print. Artistic creativity is embodied by a palette and a sheet of music, fertility by poultry and a rabbit; we see the trumpets and drums of fame, a huge palm of victory, and in the top left corner the wreath of immortality. [iiii] But the virtue of modesty is certainly not apparent. 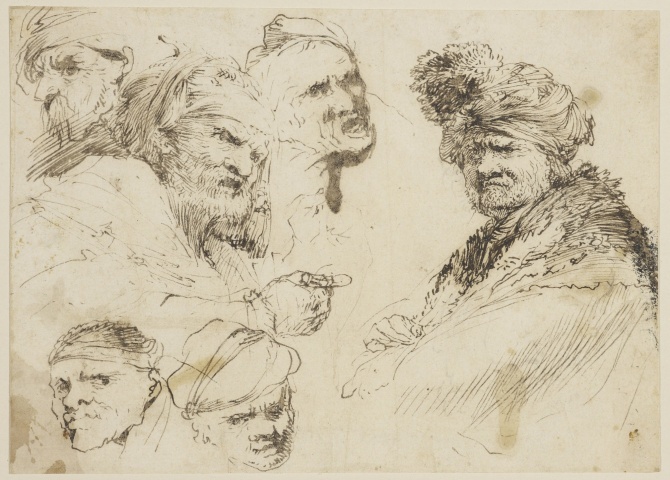 Studies of heads, c. 1635-1640. Pen and ink, brush and ink, 14.3 x 19.9 cm. Although his drawings do not lack confidence, he has been criticised for a lack of individuality. Critics of the baroque sketcher Castiglione constantly dart at the mimicking character of his opus, going as far as calling him a magpie artist. [iv] Rembrandt van Rijn, Francisco de Zurbarán, Jusepe de Ribera, Peter Paul Rubens and Anthonis van Dyck – the list of people who he drew inspiration from is long and bursting with well-renowned names. Nevertheless, looking at his creations one cannot help but admire his works, full of grace and rare beauty, of rustic charm, masterfully applied technique, and refined sophistication. There is a whole different side to El Grechetto that must not be neglected. What he lacked in originality of style, he made up for in innovative techniques. He is the mastermind behind the invention of the monotype. Furthermore, he came up with a new approach to dry brush oil sketches; both hallmarks achieved through experimentation. These two technical novelties have a common thread to them, their Castiglionesque imprint. It lies in the abruptness, the speed with which they have to be carried out; within both approaches there is room for neither hesitation nor correction. With the monotype, a crossover between printing and drawing, one must move quickly, making the print before the paint dries. When painting in this unique way with oil Castiglione used strong rapid strokes of diluted colour to outline then shorter strokes with dryer colour for the details. The oil soaked through the paper leaving a very limited timeframe for the creation of a masterpiece. As reckless, impulsive, and stubborn as he was in his personal life, he was the same in his artistic creation. 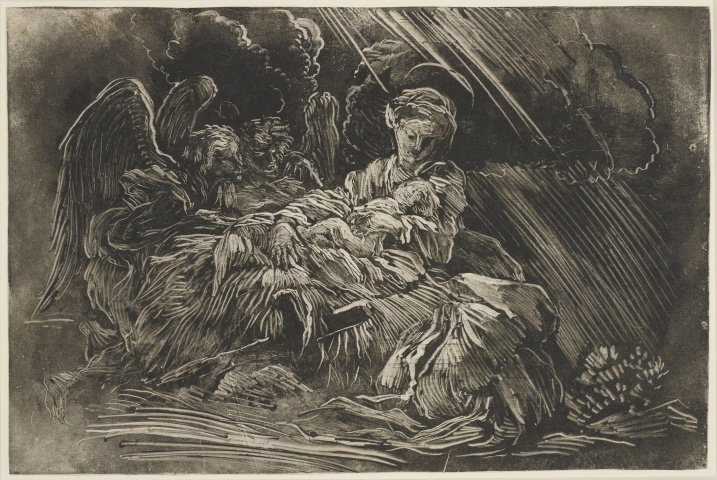 The Nativity with Angels, c. 1655. Monotype, 24.7 x 37.3 cm. These techniques reflect the artist’s nature perfectly which could be considered quite ‘modern’. His tendency to mix artistic media, his habit of creating from his head straight to the paper, without the detour of studies and further practice, not to mention his non-conformist lifestyle – it is safe to say that Castiglione was ahead of his time. The Queens Gallery could have named the exhibition ‘Rediscovered Genius’. It is an obvious attempt to restore El Grechettos name, to inspire the adoration his work deserve and to remind the public of a master’s oeuvre that contributed significantly to the progression of art, so that one day he will hopefully no longer be “probably the most innovative and technically brilliant Italian artist you’ve never heard of.”[v] For his sake and the diversity of art exhibitions in general let’s hope he is not to be lost in the seemingly bottomless vastness of the Royal Collection again – and let’s hope for more gems like this to resurface in the future.